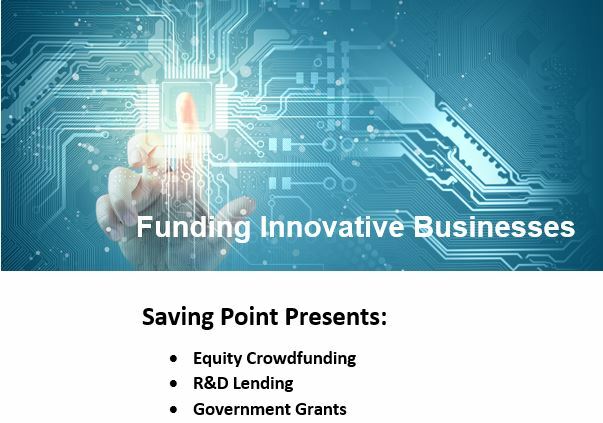 On 15th November 2018, Saving Point invites you to attend an informative session on funding for innovative businesses. Join us to learn about how Crowd Source Funding, Government Grants, and R&D Lending can benefit your business. You are welcome to extend an invitation to any contacts who may be interested in this event. Matt Vitale is the Co-Founder and General Counsel of one of Australia’s first licenced equity crowdfunding platforms. As a recognised expert in the regulation of financial services and crowd funding, Matt will be presenting on how crowdfunding platforms can be of benefit to start-ups and SME’s. Benny Kleist, CEO of R&D Lending will deliver a presentation on their financing services. R&D Lending offers non-dilutive funding alternatives for Start-ups and SME's who are receiving the Research & Development rebate. Through financing, a company can leverage their expected R&D rebate to extend cash runway, expedite growth and reduce the requirement for capital raising. David Hill, Saving Point’s Grants and Incentive Partner will present on how Saving Point is working with small businesses to access funds through the Research and Development Tax Incentive and a number of other government grant programs. RSVP: To register for the event, please click the following link before 9th November to secure your place at this breakfast seminar.